One of the most exciting and loved japanese action manga, Fullmetal Alchemist has inspired a vast number of kids and teens around the world. 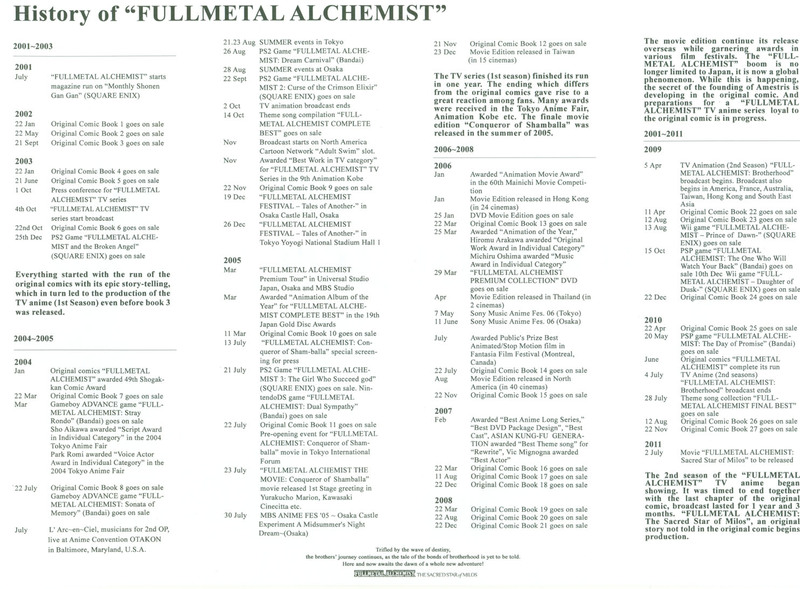 From its warm story about two young brothers, Fullmetal Alchemist is one of the best series ever made which is of course created by one of the greatest japanese mangaka, Hiromu Arakawa-sensei. We adults are angered by the senseless things that happen every day in this world.. But at the same time we repress those feelings by telling ourselves �There was no other choice� or �There must have been a reason for it.� But it�s a natural human reaction to be outraged when senseless things happen. Some things can�t be justified or rationalized. The series is about regrets and accepting mistakes while finding happiness and lessons from it. It's about gaining strong bond with family and friends, and surviving altogether from fighting against human weaknesses. If you are looking for the perfect series there is, Fullmetal Alchemist is the series for you.! The story starts with two alchemist brothers, Edward and his younger brother, Alphonse Elric who is in a suit of armor. Both brothers are on the quest to find the legendary Philosopher's stone, which is a powerful energy that could be the answer to bring their original bodies back. When they were young, their father left them and their mother died from a plaugue. Because they were lonely, Edward and Alphonse committed an alchemical taboo called the Human Transmutation. A scientific process that would resurrect the dead with the use of alchemy. Not knowing that what they were doing was wrong, the process backfired and Alphonse Elric lost his entire body while Edward lost his left leg. Edward realized that the only family that he was left was also gone, Edward bounded Alphonse' soul inside a suit of armor while he lost his right arm as a toll. The brothers survived the incident and a year later Edward was in full automail (mechanical) arm and leg. They burned their house as a symbol of their resolve to never look back, and Edward took the State Alchemist exam and became a military officer with a code-name Fullmetal. As they further find answers about the Philosopher's stone, the more they learn about their country's secrets and immortal enemies called the Homunculi. They also gained old people friends that supports them with their goal. As the series goes on, the story and plot expands into a rich unified colossal story with a large number of characters and each of these characters has their own badass development. The series started in 2001 and released its final chapter in 2010. It was published in Square Enix's GanGan and has a total of 27 volumes. For more information about the publication of the series and anime and other franchises, click the image on the right, it's the timeline for the series which is from a booklet from the 2011 Hagaren Movie. If you are new to the series and is looking for a perfect story, I suggest you should try and read the manga. It is my favorite series of all time and I hope that you will give it a try after visting this shrine. Characters: → a little dictionary of the cast of the series.